As I wrap up a very solid two week block of training, I got to thinking that with everyone I’ve talked to in this great sport, there is always that one workout that just gives you a certain satisfaction..a certain excitement when you see it inked into the calendar. Indeed, I have spent many an hour engaged in conversations with fellow athletes about our “favourite workouts”. They range from favourite interval workouts to long, steady runs, and have reasons varying almost as widely as the type of people I talk to. There is no right answer…what works for me may not be what works for you, and you may not get the same enjoyment out of it. But it helps to share, because this spirit of collaboration is what makes endurance athletics so great. So let’s dive right in! For reasons only known to someone out there who is not me, my progressive long run that is one of the reasons that I look forward to my weekend training as much as I do. A progressive long run is just that…a long run (usually 60 to 120 minutes in length for me) that gets progressively faster over the course of it, with some variations. It is a departure from the previous widely-held belief of a weekly long, steady endurance run, as it adds a note of intensity and variety to what was previously a metronomic, grinding pace. The best part of these progressive long runs is that they can be as formal or as informal as you would like. During my build up to the Grimsby and Chilly half marathons, each minute of my long runs was scripted to simulate a race effort as much as possible. It involved me doing bursts at or near race pace on legs that had already been put through a steadily increasing pace for an hour or more. But they don’t have to be that scientific. Sometimes it can be quite liberating to just go out and run, and just letting the pace naturally drop as your legs work themselves into it. This flexibility is what has made progressive long runs a staple in my training. Interestingly, I happened upon them for two reasons. One is simply through the evolution of commonly held beliefs…the other was borne out of necessity, and provides and interesting contrast between my training as a single-sport and a multisport athlete. Let’s talk about the latter first here. When I was a single sport athlete, I had time to get everything in. A typical week involved alternating hard interval days with “easy” recovery days. Even with three hard days in a week (Tuesday/Thursday/Saturday) and a long run on Sundays, I still had 3 days available to me for recovery (though whether or not I used them properly is another post altogether!). However, when I added in the need to cycle, it became much more difficult to get all the required training in and still have enough time allotted to recovery. The answer was to combine workouts together. These progressive long runs are a perfect example, as there is a significant endurance-building effect to them, even as you depart Zone 2 (aerobic endurance) and enter Zone 3 (“The Sweet Spot”). The early portion is steady and aerobic, and the later, faster portion of the run serves to increase stamina and build strength for those tough final miles of a race (or for that run at the end of a multisport race). It also serves to recruit those fast-twitch muscle fibres that don’t see much action during the long, slow distance run, helping to build their endurance as well. The combined effect of quality and quantity only burns one day of training…perfect for the time crunched multisport athlete. Many contemporary marathon runners have shifted their training towards this type of work, with some doing 30-40km of marathon pace work once or twice a month. The effects of running harder for longer are very real. But be forewarned…they are very difficult on the body. Doing these on a weekly basis may not be for everyone. Renowned marathon coach Renato Canova is often considered the innovator of this new way of looking at the long run, and even his athletes often are only doing these runs once or twice a month. Ensure you have allotted the proper recovery time for these workouts, as they can certainly take a toll on the body. But I will gladly trade taking a recovery day or two for the pure exhilaration of starting off slow and ratcheting the pace up slowly throughout the run until I’m sustaining a pace that has people stopping my to ask, “What, are you training for Around the Bay or something?” Nope…just your friendly neighbourhood sprint duathlon. As for me, I just wrapped up two pretty easy weeks to give my body a rest after 4 months of hard half marathon training. Highlights of the last few weeks have been a 5W FTP improvement during my latest test, a solid 90 minute run at the Ignition Fitness Big Training Day, an excellent 5 workout in 3 day block during the middle of last week, and yes…a long progression run on Sunday to wrap it all up! Next on the docket is Harry’s Spring Run-Off (out of the elite corral) on April 5 to see where my run legs are over a shorter distance, then Paris to Ancaster for my first real bike race experience! Pretty excited for that, and of course I will be accompanied by my girlfriend Emma, who will likely be volunteering at the finish line of these races! I am also excitedly awaiting the arrival of my new TT bike, a Felt B16 through the Ignition Fitness/Felt Bicycles sponsorship. We are also looking around for Emma’s first road bike as the weather warms up, so that she too can enjoy the thrills of running and riding! My first multisport test of the season will be at the Iron Hawk/Ontario Sprint Duathlon Championships, then a full slate of Multisport Canada races as part of the Recharge with Milk Ambassador team. Thanks to John and the guys for setting that up, and to Tommy, Roger and the Ignition Fitness crew for getting me into really good shape, both physically and mentally! So until next time, keep Du’ing it! New Partnership with Multisport Canada! I am very excited to announce that I am the newest member of the Multisport Canada/Recharge with Milk Ambassador Team for the 2014 season. This is a program set up by the guys at Multisport Canada that aims to increase exposure on both sides of the partnership with young, up-and-coming multisport athletes. I have recently taken it upon myself to become an advocate for duathlon in Ontario, trying to drive excitement for the “lesser” multisport and promote what has become a VERY competitive and tight group of athletes spread out across Ontario. Part of that is building moment for a new Ontario Duathlon website created by myself and Larry Bradley (still in its infancy at this writing), and any vehicle of promotion for that movement helps. The Ambassador Team for this season is a tad light on duathlon representation, so I am very glad I was about to work together with John Salt, Roger Hospedales, and the rest of the Multisport Canada crew to make this happen. Most of all though, I am just happy to be able to be a part of creating excitement for the Multisport Canada/Recharge with Milk triathlon series. Since my very first MSC race at Cobourg in 2012, where John Salt personally shook my hand as I staggered across the finish line after completing my first international distance duathlon, I have felt no compulsion to look elsewhere for the bulk of my race schedule. The following two seasons, I have done everything I can to fit as many MSC races on my calendar. The organization is second to absolutely no one, the service level is unrivaled in endurance sports, the venues are fantastic, and the athlete focus is greatly appreciated by everyone I have talked to. Frankly, I have never heard a bad word. Look for me at races this season! I will be in Welland, Woodstock, Toronto Island and Lakeside this season, and I love to talk shop. Meet the whole team here. Looking forward to the upcoming season! Word came from Multisport Canada this weekend that the new Half Distance Duathlon added to the BarrelMan weekend would have to be cancelled. While the reasoning behind it is sound, this comes as a huge blow to duathletes in Ontario banking on the long distance race to end off their season. With Peterborough and possibly Welland on the schedule for a similar distance, 2014 was shaping up to be a rare year for long course duathletes to be able to focus on the longer distance. While triathletes generally have a wealth of options to choose from when it comes to race distance, the scarcity of longer distance duathlon offerings makes it very hard for those with long course ambitions to gear a whole season towards the distance. That’s a lot of stress to put your body through for a pay-off of one race, but 3 offerings makes it much more feasible. Duathlete friends that I have like Larry Bradley of Mississauga and Daryl Flacks of Windsor seemed to be reveling at the possibility of a long course season! The long course duathlon race at the BarrelMan triathlon was aggressively lobbied for by Larry, in the interest of duathletes around Ontario. However, declining registration for longer distance duathlons has been a chronic problem in Ontario, with some fantastic races at excellent courses drawing only 20-25 competitors to the line on race morning. As such, a minimum registration number of 25 entrants was instituted in order for the race to be staged. A preliminary survey suggested enough interest for MSC to open registration and plan the logistics for the first run, with even some interest south of the border! However, registration was slow to develop, and with only a week until the deadline, registration had just cracked double digits. The deadline came, was extended, and went with a final registration tally of less than 15 competitors, spelling the end of the dream. I’m not here to dispute the decision, which I believe to be sound and justified. Staging a race for less than 20 competitors just seems ridiculous, especially when the race is a large-scale, point-to-point course that requires the design and implementation of a completely new run course in Welland. Sounds like a losing proposition to me. The guys at MultiSport Canada work themselves to the bone to provide a top-notch race environment, and to expect that same commitment when we can’t even prepare ourselves to commit 6 months in advance is absolutely absurd. No, I’m here to to implore duathletes in Ontario to reassess our priorities here and save our sport, and to figure out why we let such a wonderful opportunity slip away. The problem seems to lie in the length of the commitment. Perhaps we were just…too afraid of laying out that investment without knowing whether or not we will be fit or healthy come race day. It is quite the commitment. However, I think the more likely answer may just be apathy. I am relatively new to the sport, having only competed for 2 full seasons, but I have already noticed that the effort put in by race directors is not matched by the commitment of the competitors in duathlon. Too many people just expect to be able to show up on race day and for there to be a race for them to compete in. I hope we realize the behind the scene logistics that have to go into putting on a duathlon! Building a second run course, coordinating the start times and the timing systems, making space in a transition area by taking away spots from the (more popular) triathlon…even colour coded bibs so that each race can be differentiated…this all costs something! And to do it for 20-some athletes…well that seems like a disconnect. There is an alternative explanation, one that I can understand because well…this was my reasoning. I’ll admit I’m just as guilty here. I didn’t enter because I am just plain not up to the distance. It took me 9 years of running experience and endurance-building to attempt my first half marathon, and that left me a sniveling mess for hours after the race. With only 2 seasons of cycling under my belt, a race with a 90k ride is nothing more than a distant dream. I would have loved nothing more than to support my sport and compete in Niagara Falls…it just wasn’t in the cards for 2014. Maybe others were in the same situation. Maybe there just isn’t a market for long course duathlon. Duathlon is incredibly hard on the body in the first place. That first run trashes your legs, and more often than not the second run consists of a lot of just trying to hold it together. In terms of difficulty, I’ve heard comparisons between international distance duathlons and half iron triathlons. Most who have moved up in distance have gotten themselves into the water to go chasing after the illustrious Ironman label. That in itself could be a big contributing factor to declining registration numbers for long duathlons, even the 10k/40k/5k distance. Agree? Disagree? Discuss in the comments or join the discussion on Twitter. Regardless of the reasons why only 13 athletes registered for the race, there is no doubt that this will have a detrimental effect on duathlon in Ontario. If we have not lost the faith of race directors already, we must be mighty close. For a race to be lobbied for, created, and planned only to watch it fail for lack of interest would not make me want to go out of my way to create opportunities for a group. We have two separate race series that run duathlons alongside almost EVERY triathlon weekend on their schedule. This is a luxury that not all duathletes have, and most are forced into the water very early due to lack of race options. We are LUCKY to have what we have, NOT entitled to it. Duathletes, we need to work a little bit harder and show a little bit more initiative in order to continue to be pampered by race directors the way that we are. So this is my open plea to Ontario duathletes: PLEASE don’t let this sport die. I love it too much, and I am nowhere near ready to get into the water yet. Let’s use 2014 to prove to race directors that we are a strong group with a stronger voice. So this year, Tommy and I decided to do a half marathon or two in the winter months. The idea behind it was the use the goal of a March half marathon as a good excuse to put in some big endurance work over the winter and build a massive base of volume, and then use the half to judge how we had done with it. It seemed like a good idea until the Polar Vortex decided to rear its ugly mug, which made training a little more difficult. However, I was still able to get in some long endurance runs, some great progressive long runs, and some solid threshold work heading into my race. And training in the cold and winter day in and day out really helped the mental toughness aspect of it! Originally, the plan was to bust rust at the Re-Fridgee-Eighter 8 mile race in Waterloo two weeks out from Chilly, and then debut at the half in Burlington on March 2. However, the 2014 version of the Waterloo running series bumped the Re-Fridgee-Eighter back a week, making it too close to Chilly to be worth it. In its place we decided to head to Grimsby for the Family Day Half Marathon, and play it by ear. It was kind of a risk to head to Grimsby, because it meant running two half marathons in a span of 14 days. As a result, I went into Grimsby super cautious and ready to pull the plug if anything didn’t feel right during the race. The idea here was just to get my feet wet at the distance and experience 13.1 miles of hard running in advance of Chilly, while not doing anything to compromise my A race. And if I could get under 1:18…bonus!! I felt this one went very well. I went in eyes wide open and just hoped to hit the pace. The plan was to go out at Chilly pace for 5k, back off in the middle, and then try to close the last 5k hard. It was a sunny day, but cold (-12) and windy along the lake. I ended up all by my lonesome for 18k, because the top 2 guys went off the front very early, leaving me behind in 3rd. 5k was hit in just a shade under 18:00, feeling very smooth and strong, and I backed it off to 3:42’s from there. I was amazed at how fast the first 5k went by…it just felt like a training run compared to the shorter/faster races I was used to! After 5k however, the race started to drag on a little bit. Going through 8k and then 10k was daunting, as I started thinking that in every other race I had done, I would be finished instead of only halfway there! So mentally it was a little challenging, but my body was feeling well enough to press on. At about 12k, two things happened: my stomach started to grumble, and my hip flexors were starting to lock up. The first should have been easy to solve…if my gel hadn’t been frozen in the cold! After a couple tries at it, I gave up eating as a lost cause and hoped all my long runs done without nutrition in my naive years would come in handy. As for my hip flexors, I had to make an assessment as to whether or not it was just race-related, which I felt it was. No one said half marathons were easy! I hit 10 miles in a shade over 59flat, and geared up for the last 5k. Luckily, the 4th place gentleman had been shadowing my for 10km, and his footsteps were imminent at 16k, so I would finally have someone to work with. I just tried to focus on finishing strong over the last 5k while holding him off. I switched into race mode here, which is where I think I truly shine. I held him off until 18k, when he made the pass. I immediately hopped on his shoulder for a respite from the wind, and concentrated on not letting the elastic snap. I kept in contact over the overpass through 20k, and then felt another wind come. I decided to make my move, and easily put distance on my foe. I held strong to the finish, and crossed the line 3rd overall in 1:18:01, thanks to Warren Ringler for the push to the finish…I really needed that! In the end, I was quite glad to do the full distance. It opened my eyes up wide to the difficulty of the distance, which ended up being invaluable experience for Chilly. I was exposed to the dangers of going out to hard and just trying to hang on for 21km…this distance isn’t like a 10k, where if a rough patch hits, survival mode kicks in! Even rough patches can be bounced back from when the race is this long. With this in mind, Tommy and I decided to plan on trying to run 3:35’s as long as I could at Chilly, and just to assess every 5km to see if the body was responding. And to hope for a nicer day on March 2. Well…on March 2 I woke up to temperatures around -20, clouds, and a fresh coating of snow on the roads. Oh joy. The trip to Burlington and my preparations were uneventful, aside from the nerves. Despite the experience I gained in Grimsby, this would be the first time I would be “racing” a half marathon…Grimsby was more of a training day than anything. Right off the gun, I got myself at the back of a large front pack of 20-25 runners. There was a gusty wind that I wanted to protect myself from as long as possible. I stuck there until the first turnaround, where the pace got to quick for me. I pressed on alone at my pace for awhile before settling into a small group of 3 or 4, who I was able to work well with in the wind for the next 7km. I hit 10k in about 35:30, right on about 1:15 pace (which was the goal way back at the start of this). At this point, I was feeling good, and was maintaining a pretty consistent pace right around 3:33’s. I was able to maintain that (with some help) through 12k, when I had another pivotal moment of realization. Just like in Grimsby, I noticed two things at 12k. The first was a need to eat…thankfully my gel was not frozen this time, and I got that down, problem solved. The second thing would pose more difficulty, and would define my race. I had started to feel the elements wearing me down. I hadn’t noticed the cold and wind all that much through the first half of the race, but at this point, the cold, the wind, and the spray coming off the wet roads were starting to wear on my legs. As long as I could stay in the group, I was able to hold on, but I could only stick in the group until 16k. After going through 10 miles in about 57:30, I was left isolated in the cold, and I switched into survival mode. The legs just started to cramp up, and it just got to be too much without anyone to work with. The last 5k passed slowly and agonizingly, and my paced crept up over 3:40/km as I just tried to get to the line. But I was able to cross in 1:16:24, a new PB by over 90 seconds, and a whole lot of lessons learned. All in all, I think we accomplished what we set out to accomplish this winter. I put some good miles in, got a good base under me, and got my feet wet at a distance that I think I have a real future at. I really enjoyed the half marathon distance, and wouldn’t hesitate to run another one. With some experience, I think I have a rapid improvement curve on the roads, and I’m really looking forward to cutting another two minutes off at my next half marathon! 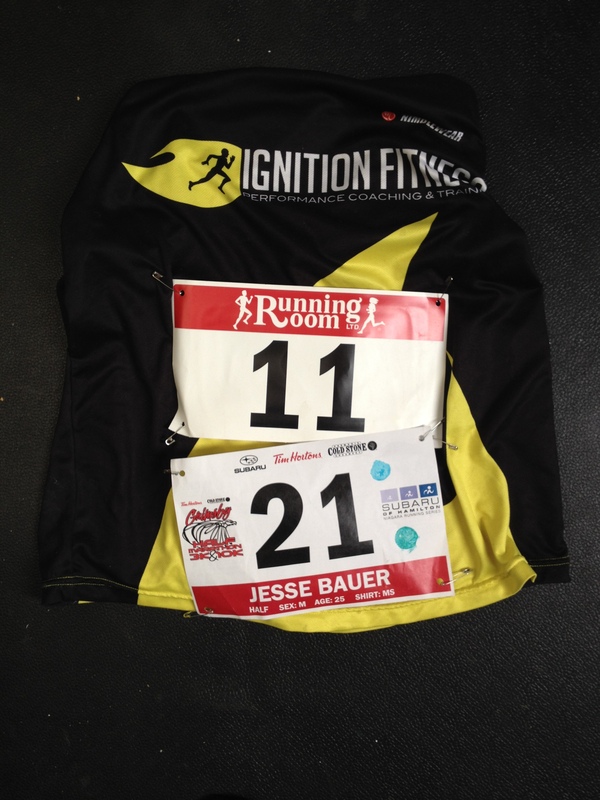 Thanks to Ignition Fitness for the coaching and guidance, Clif Bar for keeping my fueled in training and racing, Hamilton Runner’s Den and Dan Pauls for all the race advice and gear tips, and most importantly my beautiful girlfriend Emma for braving the cold and wind in both Grimsby and Burlington, for cheering me on and giving my your unwavering support during the races (with your awesome sign!) and in all the hours of training and preparation for these races.